What makes me think the economy is slowing? Because that’s what corporate America is saying. 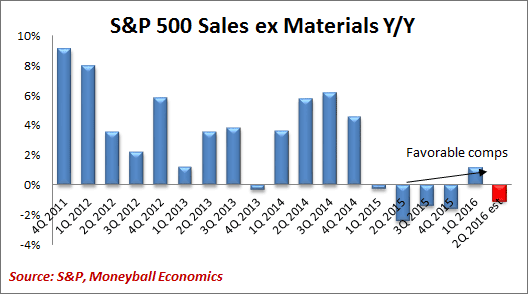 We know that there’s an industrial recession going on… even if we remove those commodity impacted sectors like materials. It’s no longer an excuse. Revenues continue to contract. Businesses expect anemic growth through 2017. 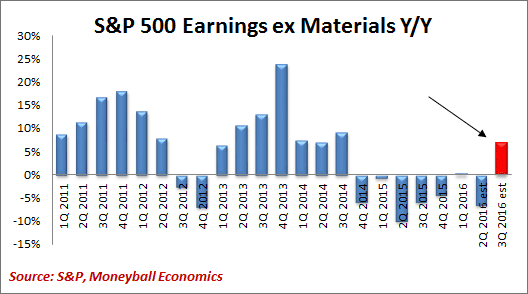 But never fear: even though companies are guiding revenues for 2016 and 2017 to stagnate, they expect earnings to shoot up. How can revenues stay flat while earnings rise? Partly from companies instituting cost-cutting measures. For example, sales people have been told to cut back on the expensive wining and dining. Ruth Chris’ steakhouse reported a drop in foot traffic this last quarter. And, in case you didn’t know, business meals are the majority of Ruth Chris’ businesses. Companies are also cutting back on business travel. Marriott hotels reported a 10% drop in room bookings by their top 300 corporate accounts. That’s not a typo: a 10% drop. This amounts to billions of dollars over time. However, this simple “belt-tightening” isn’t enough. Just as I mentioned in last week’s Moneyball essay, Metlife CEO – Steven Kandarian – gave us insight into the labor market on its earnings call a few weeks ago. Cisco Systems (CSCO): 5,500 layoffs. These companies have reviewed their business activity and decided that they have more people than they need. Or seen as too many people for the work expected. Central banks get concerned when an economy is operating at the extremes of resource utilization. 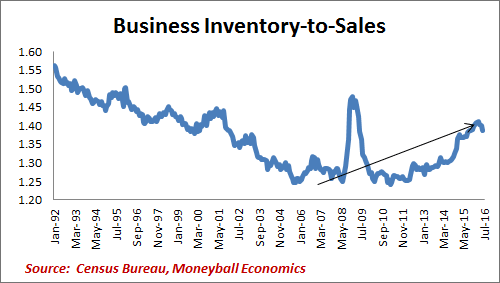 Too much excess supply (conditions are slack) and the economy is recessionary. Little excess supply (conditions are tight) and the economy is in danger of overheating. Now, let’s distinguish between inflation created by resource utilization and inflation created by government policy. Examples of “artificial inflation” include minimum wage hikes (government created wage inflation) and Obamacare (government created healthcare inflation). The key point is that inflation created by resource utilization will respond to things like interest rate hikes. Make it too expensive to borrow money, and business investment will slow down, for example. But the other types of inflation won’t respond to Fed monetary policy. Think about it: Are healthcare costs going to slow if the Fed raises interest rates? Absolutely not. Meanwhile, resource utilization is falling. There are lots of signs that labor resources are underutilized across the entire US economy. For example, fewer hours are being worked. In fact, people are working the fewest hours since 2010. 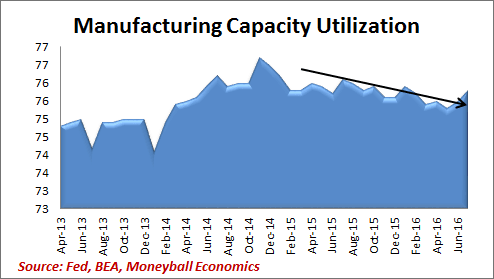 Echoing the increasing level of slackness in the economy, factories have a lot more spare capacity than they did back in 2014. As you can imagine, the overhang of underutilized capacity means that producers have no pricing power. That’s disinflationary (another great economic term that basically means prices may not be going down but they aren’t going up either). Against this background of rising slackness in the economy, it’s decision time for the Fed. The Fed has signaled that they are open to raising interest rates at their next meeting September 21. This would be horrible for at least three reasons. First, because raising rates when the economy is slowing is, well, dumb. Even a 0.25% hike can slow the economy significantly when it’s growing barely 2%. (We saw what happened when the Fed raised rates last December. The market tanked in January-February: see reason #2. And first quarter GDP came in at 1%). Second, because it could cause turmoil in the markets because many think it is the wrong move (a policy error). The Fed has done a marvelous job of telegraphing their intention, but the market is unconvinced. Without buy-in, the Fed runs the danger of moving counter to the markets. Third, because it may say that the Fed really doesn’t know how to measure the economy’s strength. Let’s focus on the last point because that’s where the opportunity exists. Focusing on the third point will allow us to be better at reading the tea leaves. What Data REALLY Matters to the Fed? Labor is the main area of focus because it’s the gas that fuels the economic engine. It’s the universal common denominator across all sectors. Federal Reserve Head Janet Yellen says the same thing at every single conference: she’s watching for signs of inflation and in particular inflation that is being created by resource utilization. If resource utilization was at a normal level and inflation was equal to 2 percent, policymakers would presumably opt to set the real federal funds rate equal to the equilibrium real rate in order to maintain those conditions. Accordingly, if the equilibrium rate is rising over time, the “neutral” setting of monetary policy should be rising in tandem. Although the unemployment rate may now be close to its longer-run normal level–which most FOMC participants now estimate is around 4.9 percent–this traditional metric of resource utilization almost certainly understates the actual amount of slack that currently exists: On a cyclically adjusted basis, the labor force participation rate remains low relative to its underlying trend, and an unusually large number of people are working part time but would prefer full-time employment. Consistent with this assessment is the slow pace at which hourly wages and compensation have been rising, which suggests that most firms still find it relatively easy to hire and retain employees. As we’ve just seen, the private sector faces increasing labor slackness and conditions that spell the exact opposite of resource utilization. The evidence is everywhere. Labor inflation is coming. Not from market forces, but from mandated wage increases. And it’s going to get worse. Go back to that revenue slowdown issue. Companies are already responding in the only ways they can: smaller wage increases where possible and selective headcount trimming. October is when the macro labor data takes a turn for the worse. Payrolls will be the first to get hit because hiring will slow first. September Nonfarm Payrolls will sag even more (released October). Jobless Claims will get hit later (it takes ~90 days for white-collar layoffs to work through the system). But since Jobless Claims released in real-time, the impact is evident in October as well. Remember, although companies are announcing layoff plans now, preparations have been underway for some time. A lot of action is happening under the surface. KEY POINT: The Fed is talking about raising rates at exactly the wrong time… when job layoffs are increasing. Jobless claims will rise as companies implement even more job cuts in the coming months.